‘One-stop shop’ model of providing a coordinated and comprehensive package of support addressing the myriad needs that accompany poverty. Meal Prep – 6 volunteers help with sorting food donations, preparing dining room, assisting the chef. Pantry Stocking – 5 volunteers to help stock pantry shelves. Organize, activate, and engage the Israeli-American community nationwide. Hands on – 50 volunteers craft bird feeders and grass heads to give back to natural world around us; as well as a special edible plant treat for our young volunteers. Participants in the BJCC’s Meal Prep and Tu B’shvat seder, are invited to make use of a charter school bus leaving from the Riverdale Y for the Amalgamated Housing Corporation at 1 pm. The bus will return to the Y upon completion of the project by 4 pm. Should there be any additional questions or concerns regarding transportation please contact Rabbi Joseph Robinson. 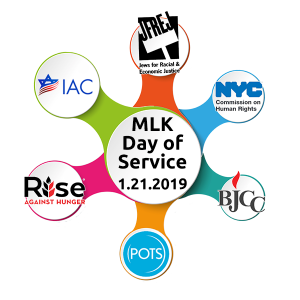 Join the Riverdale community on Monday, January 21 for a day of service supported by UJA Time For Good, coordinated by the Riverdale Y. Discover the opportunities below. For more information, contact Rabbi Joseph Robinson at jrobinson@riverdaley.org. Providing food and life-changing aid to the world’s most vulnerable. provides public education about the Human Rights Law and helps cultivate understanding and respect among diverse communities. A non-sectarian, community based, social service organization that is available to all low-income individuals in the Bronx. Meal Prep – 40 volunteers for packing raw materials for a complete meal of soup in a mason jar. Followed by a festive Tu B’shvat seder, meant to provide visitation to senior community members. Set-up – 5 volunteers lay out materials for meal prep and seder. Fight for a sustainable world with an equitable distribution of economic and cultural resources and political power. Hands On – 30 volunteers assemble care baskets for New Yorkers with challenges of securing health care and home care. Providing new homes for wonderful pets, both cats and dogs, as well as giving these unfortunate and abandoned animals a new “leash” on life. Dog Bones – volunteers will make dog treats to provide a bit of comfort for our four legged friends.